When moving to a new residence, fragile items get most of the attention and heavy items cause the most pain. Clothes are not something people think about too much as they progress towards their moving day because fabrics are light and unbreakable. In addition, people fold and pack clothes often, from the washing machine to the dresser, from the dresser to the suitcase, so most people think they have the clothing portion of the moving process all figured out, and maybe some of you do. Considering that the average American household spends $1,700 a year on new clothes and another $500 a year at the dry cleaner, we should probably reevaluate how we move those “valuables” around. Clothes take up quite a bit of space, and cramming them into boxes and trash bags might not be the best idea. You must use an efficient strategy to avoid wrinkled and damaged clothing and an expensive cleaning bill after the move is complete. First, unload the clothing you no longer need. There is no point in moving clothes that you have not worn in ages or do not fit you anymore. Many people attach sentimental value to clothes or recall the money that they spent to purchase the article of clothing, and they just cannot manage to sever ties with some items. Moving is the time to distance from any clothing that you have not worn in many moons. 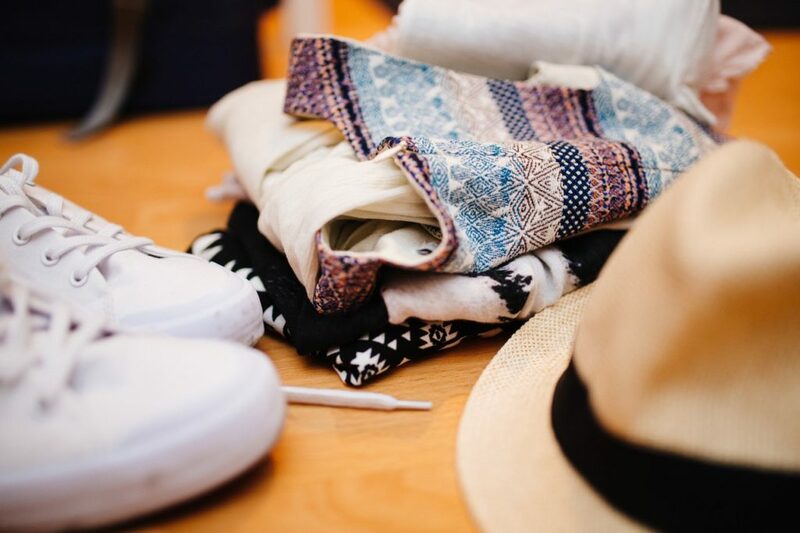 If you have not worn an article of clothing in a year or more, it is time to downsize and create some space from the item itself, and create some space in the closet in your new home. Additionally, if you have children, they certainly have clothes that do not fit them any longer. Donate the clothes you no longer wear to a charity organization, or sell the clothes to a resale shop, sell them in a garage or yard sale with all the other items that you no longer use, or sell them in one of the many online outlets where goods are purchased like Craigslist. The sale of the clothes you no longer wear could assist you with moving costs, and definitely assist you with fewer boxes to pack and move. First, pack the clothes you will not wear for a while because they are not in season, or are specialty clothes and formal attire. Second, put aside clothes you will wear on moving day, the evening of your moving day, and the day or two after you move. These items will go into a box that includes other “survival gear” or necessities like a shower curtain and towel, toilet paper, and toiletries to get you through the first few days of moving, so you will not have to rummage through numerous boxes in a panic to get what you need. Third, pack clothes for the current season, or, in other words, the clothing you wear on a regular basis. Grouping your clothing makes it easier to find what you need in a pinch and store clothing that you do not need right away. You will also want to separate clothing items that you will want to unpack immediately after the move because it is made of a delicate material. By fabric: natural fabrics like cotton crease easily, and others like silk are very delicate, so you should take extra care when packing them. Wool clothing takes up lots of space. Synthetics and polyesters are resilient, so less care is required for them. By season: by packing clothes according to the season, you can store the items you do not need right away, which will save some space in your closet after you move. It is best to keep things simple when packing your clothes, while taking care to manage your delicate fabrics. Use a common sense approach when deciding how to package your attire. The clothing in your dresser drawers does not need to be removed and repackaged. Take the drawers out of the dressers on moving day, and secure each individual container with shrink wrap to provide a cover for your clothes, or keep the drawers inside the dresser and shrink wrap the entire piece of furniture to ensure the drawers do not slide out while moving it. Check with your mover first if you want to move the dresser with drawers inside of it. Some moving companies prefer the drawers to be removed even if they are secured in some manner. Suitcases provide a manageable way to move clothing, and they are designed to hold your garments in an efficient way. Suitcases are also great for moving your collection of shoes. Cardboard boxes often fall apart during the move, especially on wet days, so if you are looking to safeguard your garments and other possessions, you should consider a better option for moving your valuables. A move no longer requires an assortment of cardboard boxes that you collect from local stores or purchase for a one-time use and then dispose of them. The solution for San Francisco area residents is to rent plastic moving boxes from ZippGo, which saves time and money, and reduces anxiety. 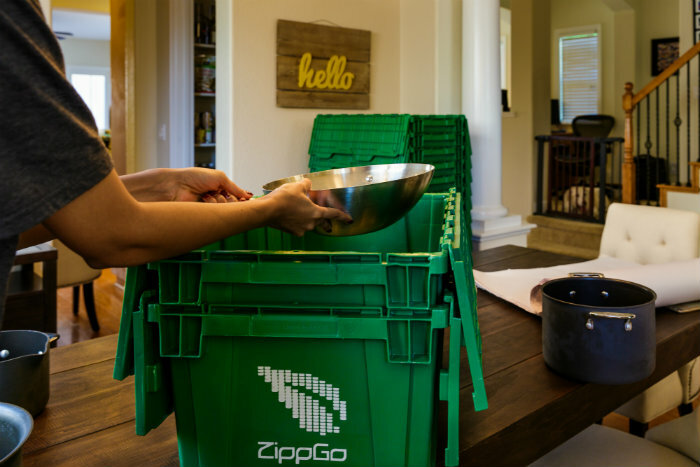 This environmentally-friendly approach to moving boxes is affordable, and ZippGo delivers the boxes and other moving supplies to your door with free, next-day delivery. Therefore, there is no need to hunt for cardboard boxes, or buy and build them. There is no need for tape because the boxes have integrated locking lids. And, at the end of the move when you’ve unpacked and are ready to relax, ZippGo picks up the boxes, which reduces waste and time spent disposing of standard boxes. The containers are crush-proof and waterproof. They stack neatly without collapsing, taking up less room in the house and less room on a moving truck. The move will go quicker, and you will save money in the end. Wardrobe boxes are the most practical way to pack hanging clothes for a move. There are many cheap and flimsy wardrobe boxes available for purchase, but ZippGo offers a better solution for your hanging clothes as well. 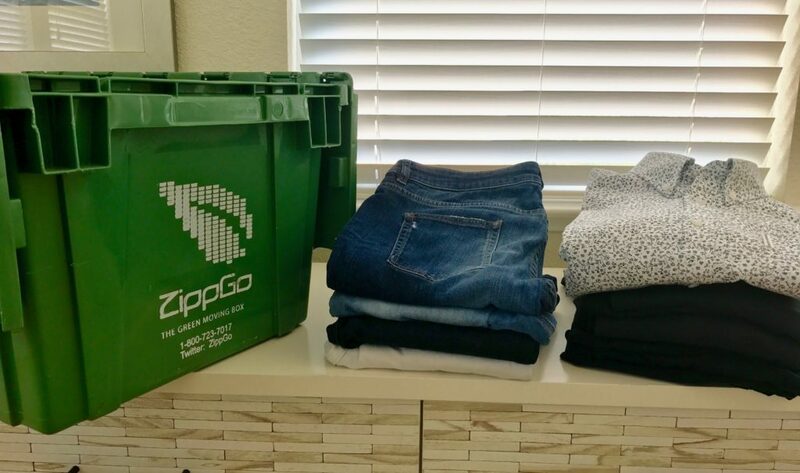 Leave the hangers on your clothes, and simply transfer your clothes directly from your closet to the metal bar in one of the ZippGo’s eco-friendly wardrobe boxes, which are made from weather resistant and ultra durable corrugated plastic, and fold flat when not in use, making them easy to manage. One wardrobe box will hold about 1.5 feet of closeted hanging clothing. Using wardrobe boxes makes packing your closet a breeze, keeps your clothes wrinkle free, and provides protection against dirt and dust. Step 1: Start with a jacket, and lay it face down. Step 2: Layer another clothing item such as another jacket, a shirt, or a short dress on top of it, but in the opposite direction, so that the jacket and this item overlap at the sleeves. Step 3: Continue to alternate shirts or short dresses in a north and south fashion. Step 4: Place a pair of pants or a long dress in a horizontal fashion, so that the waistband aligns with the left edge of the pile of clothing. Step 5: Add another long dress or pair of pants in the opposite direction. Step 6: Continue to alternate pants and long dresses in and east and west fashion. Step 7: Place knits and sweaters north and south, and pairs of shorts east and west. Step 8: After several layers of clothing, place something at the core of the layered attire, like a large book, a packing cube, or neatly stacked socks and underwear. Step 9: Working backwards, fold each individual item tightly around the core. For clothing with sleeves, wrap the sleeves before the body of the item. Step 10: Carefully place the bundle into your container. 1) Clothes that you intend to store and not unpack immediately, should be packaged with an insect repellent like mothballs. Moths and other insects are attracted to certain fabrics and will eat holes through them. 2) Do not pack clothes that are damp or dirty. Wet clothes will encourage mold growth and dirty clothes could stain other clothing. 3) Even if you use wardrobe boxes, use zip-ties to hold hangers together. 4) Place heavy clothing items on the bottom of containers, and put lighter attire on top of it. 5) Packing paper should be placed between delicate clothing to protect them better. ZippGo’s packing paper is perfect for wrapping and protecting your clothes and other fragile items. Each roll has approximately 150 large sheets that measure 36 inches by 24 inches. The sheets are recycled, making them environmentally friendly. Never use newspaper when packing your clothes because the ink from the paper can transfer onto your clothing. 6) Shoes should be boxed separately from other clothing, and they need to be wrapped carefully to ensure they do not get scuffed, dented, or crushed. Ideally, they should be transported in their original boxes. ZippGo offers moving supplies like Green Wrap Roll, an innovative bubble wrap that is made from environmentally friendly “Kraft” paper. Just like leaves from a tree, Kraft paper decomposes in a few weeks time with no adverse impact on the environment or human health. Each roll is 150 feet in length and 14 inches wide. Traditional bubble wrap is also available through ZippGo. It comes in 150 foot long or 90 foot long rolls that are 12 inches wide. These rolls provide extra protection for your fragile items. The roll is perforated every 12 inches for easier handling. Both are great for wrapping shoes to keep them safe. 7) Clothing works well for padding items that you are moving. Small clothing items that are durable can be used to wrap fragile items or fill gaps to prevent items from shifting inside of a moving container. Also, consider using sweaters and hooded shirts to fill up half of a box filled with books or other heavy objects to keep the overall weight of each box manageable. Once you finish packing all your clothes, its time to pack your kitchen and we’ve got excellent tips for packing a kitchen as well.